In the wake of Universal's 1941 hit The Wolf Man, several other studios made their own werewolf films to cash-in on a popular monster. The first of these movies was Sam Newfield's The Mad Monster (1942), produced by the Producers Releasing Corporation (PRC) and released a scant six months after The Wolf Man. The Mad Monster tries to inject some new ideas into the werewolf subgenre, but is largely undone by abysmal production values, gaping plot holes, and static direction. Scientist Dr. Lorenzo Cameron (George Zucco at his nuttiest) is attempting to build a race of wolf-men to use as shock troops in World War II. He's been booted out of the medical profession and labeled a madman, which is actually pretty accurate (Cameron is given to arguing with his critics even when they aren't there). Unfortunately for pretty much everyone, Cameron's experiment is a success. Using half-wit gardener Petro (Glenn Strange doing his very best Lenny from "Of Mice and Men") as his guinea pig, Cameron creates a slavering manbeast for use as an instrument of revenge against all who sullied his good name. It's nice to see a patriotic mad scientist for a change and Dr. Cameron's basic concept of a science-made werewolf is novel. It's a shame that his overall grand design is a bit lacking. He plans on creating a whole gaggle of these wolf-soldiers and then just letting them run amok on the battlefield, with no thought to controlling them or what to do once they have defeated the enemy. His only real control of wolf-Petro comes from brandishing a bullwhip at him, a strategy that hardly seems effective on a large scale. Then again, Dr. Cameron is a mad scientist; perhaps we shouldn't be looking for sanity where there clearly isn't any. As the wolfman, Strange gives a preview of what was to come when he took on the role of Frankenstein's monster, beginning with House of Frankenstein. His limbs are fairly stiff, his back utterly so, and he communicates only in forced growls. While not exactly somebody you'd want to take home to mother, it's not very animalistic. The hirsute head is the only real giveaway that Strange is supposed to be playing a werewolf and not an angry automaton. 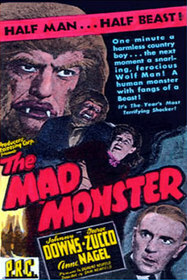 As with almost all PRC films, The Mad Monster suffers from an incredibly meager budget. As such, we're treated to cheap actors wearing cheap clothes giving cheap performances on cheap sets. The script is cheap. The props are cheap. Not only are all the elements on this film cheap, they're uninspired; given two coffee cans, a run of string, and the goal of creating a cut-rate phone, I'm not sure anyone on this film would come up with anything useful. Director Sam Newfield certainly doesn't inspire creative confidence. His approach to his films (as evidenced both here and in Dead Men Walk) is to point the camera so that he can fit all the characters in the shot and then leave it there. Often this becomes awkward when 5'4" Anne Nagel (playing the mad scientist's daughter) has scenes with the foot-taller Strange. While there's nothing technically wrong with these sequences, the framing is visually unappealing. 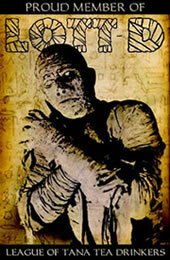 At 77 minutes, The Mad Monster is positively epic compared to the usual PRC horror fare. The extra runtime isn't used to any particular benefit however and instead just compounds the other flaws of the film. One gets the impression that if everyone involved, from the writer down to the production designer, had given just a little more enthusiasm, the result might have been quite watchable. As it is, The Mad Monster is a sad waste. Submitted by Anonymous (not verified) on Mon, 2010-02-08 09:07.